Visitors sense that Beaver is unusual -- it's nestled beside towering sand dunes that stretch for miles along the Beaver River. Beaver State Park contains acres of dunes for off-road challengers, plus fishing, hiking, day-use area, RV hook-ups and campsites. The Beaver Pioneer Golf Course is a challenging and picturesque nine-hole public course next to the park. For hunters, the Beaver River Wildlife Management Area is abundant with deer, quail, pheasant and other game. A tour of Beaver reveals an impressive school system, library, hospital and nursing home as well as interesting and friendly shops. The area's history can be explored at the Jones and Plummer Trail Museum and the c.1887 Presbyterian Church, the first church building in "No Man's Land." Each April, Beaver hosts the World Championship Cow Chip Throwing Contest, which draws international attention. The "Throw" is the climax of the Cimarron Territory Celebration, a full week of exciting activities for the entire family. The City of Beaver, the Capital of the "Territory of Cimarron," was formed in 1887 through the efforts of the early settlers to bring a measure of law and order to "NO MAN'S LAND." 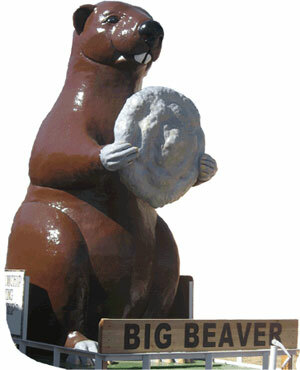 Beaver began as a sod building erected in 1879 and served as a store for cattlemen driving their herds across Beaver Creek on their way to the markets of Dodge City, Kansas. When Oklahoma became a state, the panhandle was divided into three counties, with the eastern one retaining the name of Beaver and the City of Beaver as its county seat. Approximately 520 acres in size, Beaver State Park is located in Oklahoma's panhandle region, near the city of Beaver. This park is in an area of many environmental contrasts between quiet, sheltered low pockets amidst high sand dunes exposed to the harsh panhandle elements.